Easily adaptable to edges and chamfers. Works well with all DENSOLEN® tapes. DENSOLEN®-Mastic is a permanently plastic butyl rubber filling mastic, which can be formed by hand, for smoothing uneven surfaces before the application of DENSOLEN® tapes. DENSOLEN®-Mastic is ideal for smoothing uneven surfaces caused by factors such as high weld seams. Suitable for use in any industry, DENSOLEN®-Mastic is a universal product that smoothens out uneven surfaces and protruding weld seams prior to coating with DENSOLEN® tapes. 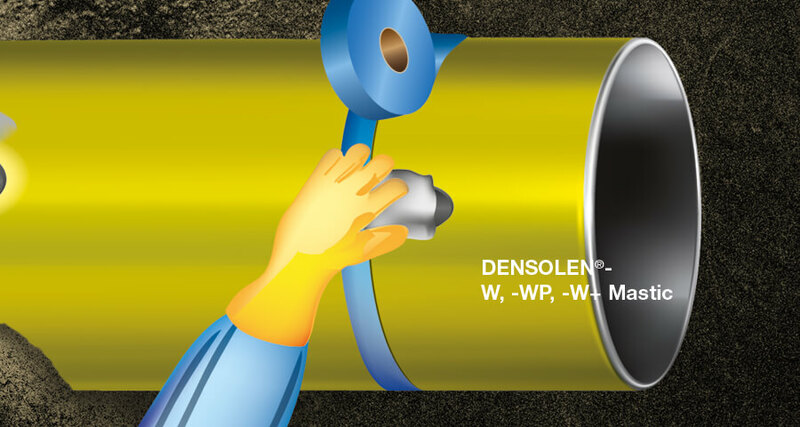 DENSOLEN®-Mastic self-amalgamates with DENSOLEN® tapes to reliably seal cavities and gaps and provide permanent corrosion protection. Common applications include the filling of chamfers in T-pieces and protruding pipeline weld seams and sealing around cable outlets from the field joint coating. We assume you are in Finland. If not, please select another region.